Meteor Shower - Solar System Planets And Moons Section. Eta Aquarid Meteor Shower Peaks on May 6. Look towards the constellation of Aquarius in the early morning on May 6. Image credit: NASA. Skywatchers are in for a treat tonight as the eta Aquarid meteors will be putting on a show. Observers in the southern hemisphere should be able to see 15-60 meteors an hour depending on the darkness of the skies. Those in the northern hemisphere won't be so lucky, seeing only about 10 meteors an hour. Look to the constellation of Aquarius, towards the East in the early morning of May 6, and you should see a more than a few meteors. Be patient, dress warmly, and bring a friend or two.. The eta Aquarid meteor shower peaks on May 5th and 6th. The best time to look, no matter where you live, is during the hours before local sunrise on both days. This is mainly a southern hemisphere shower, but northern observers can see it, too. In the United States, for example, observers far from city lights might see 5 to 10 meteors per hour. In Australia or South America, rates are better, between 15 and 60 meteors per hour. 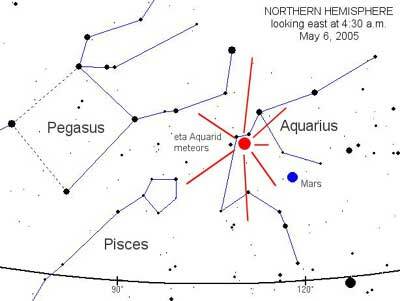 This year (2005) the eta Aquarid meteors will be streaming from a point in the sky coincidentally close to Mars. The red planet, which is approaching Earth for a close encounter in October 2005, is already eye-catching. Eta Aquarid meteors come from the most famous Comet of all: Halley's Comet. Our planet passes close to the orbit of Halley's comet twice a year. Although the Comet itself is very far away [diagram] tiny pieces of Halley are still moving through the inner solar system. They're leftovers from the comet's many close encounters with the Sun. Each time Halley returns (every 76 years) solar heating evaporates about 6 meters of ice and rock from its nucleus! Debris particles called meteoroids, usually no bigger than grains of sand, gradually spread along the comet's orbit forming an elongated stream of space dust. Earth passes through the debris stream once in May and again in October. The eta Aquarids are named after a star in the constellation Aquarius. The star has nothing to do with the meteor shower except that the shower's radiant happens to lie nearby. (The radiant of a meteor shower is a point in the sky from which the meteors appear to stream.) The eta Aquarid's sister shower in October is called the Orionids, after the constellation Orion. The eta Aquarid radiant never climbs very far above the horizon in the northern hemisphere. That's why it is a better shower south of the equator. Most years northerners count about 10 eta Aquarid meteors per hour, while southerners see 3 to 6 times that many. Northern sky watchers sometimes spot spectacular "Earth grazers," while the active eta Aquarid radiant is low on the horizon. These are meteors that skim horizontally through the upper atmosphere. "Earth grazers" are typically slow and dramatic, streaking far across the sky. The best time to look for Earthgrazers is 2:00 to 2:30 a.m. local time. Middle-latitude sky watchers in both hemispheres will see the eta Aquarid radiant rise over the eastern horizon at approximately 2:30 a.m. local time. Aquarius is a fairly dim constellation. The nearest bright star is 1st magnitude Fomalhaut in the constellation Piscis Austrini. Fomalhaut is a good finder star for sky watchers in the south, but it's not much use to northerners because of its low altitude. In Sydney, Australia, for example, Fomalhaut will be visible at 4 a.m. at an elevation of +25 degrees, just above and westward of the shower's radiant. Experienced meteor watchers suggest the following viewing strategy: Dress warmly. Bring a reclining chair, or spread a thick blanket over a flat spot of ground. Lie down and look up somewhat toward the east. Meteors can appear in any part of the sky, although their trails will tend to point back toward the radiant.